I think it’s been raining now for…oh, I don’t know…EVERY DAY FOR TWO MONTHS! Chicago, what is going on!? This gloomy weather is really hindering my BBQ-party abilities and bumming me out. So I figured despite the weather I could at least be eating some of my fave summer dishes inside while I watch the rain hit the windowsill. 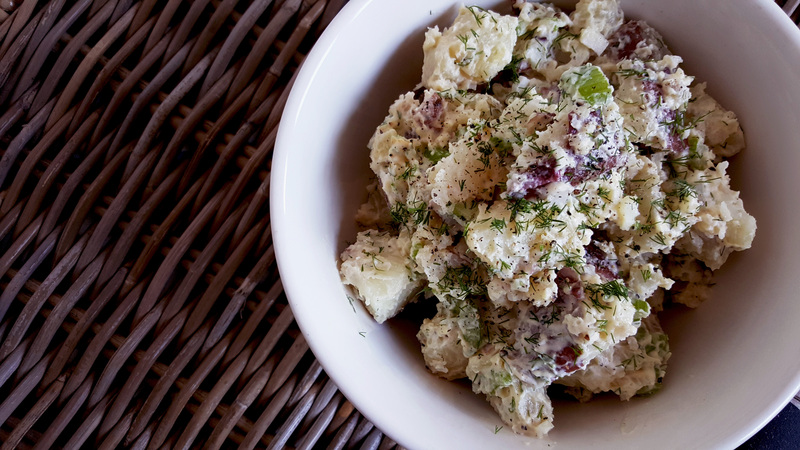 I kicked off my little pretend it’s summer and sunny eating fest with my favorite – potato salad. 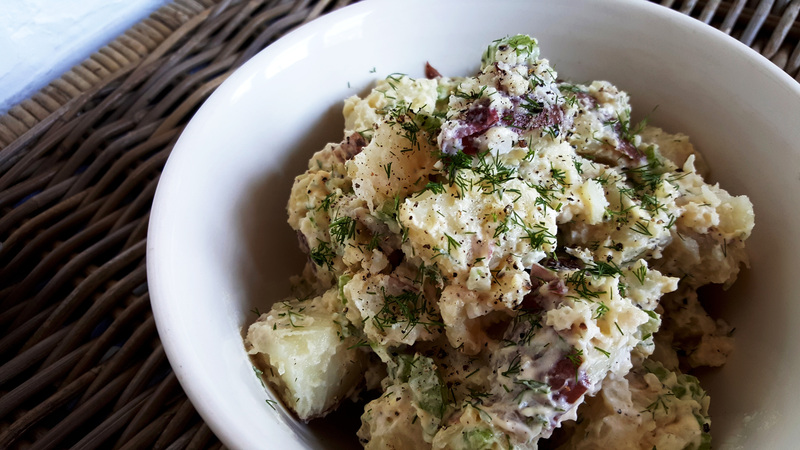 In all honesty I like my potato salad pretty simple – no frills or fancy needed, and usually I find the fewer ingredients the better (well except for the bacon & corn potato salad I posted last summer – YUM). The recipe below is one of my favorites I whip up and love to eat when the potatoes are still just barely warm (Is that weird? Am I the only one who does that)? I love all the crunchy celery, sweet onion, fresh dill and tangy Dijon, and yes I use Grey Poupon, because fancy INA says so. Get a big old pot of water boiling, chop the potatoes into 1 inch pieces, and toss ’em in. Boil until cooked through but not mushy! Once cooked, drain and let cool down to room temperature. In the meantime make the dressing. Mix the mayonnaise, dijon mustard, dill (1 tbs, reserving the remaining 1/2 tbs to top finished product), salt and pepper in a large bowl. Whisk together until well combined. Then add the potatoes, celery and onion to the dressing and toss until everything is well coated. Definitely taste it! 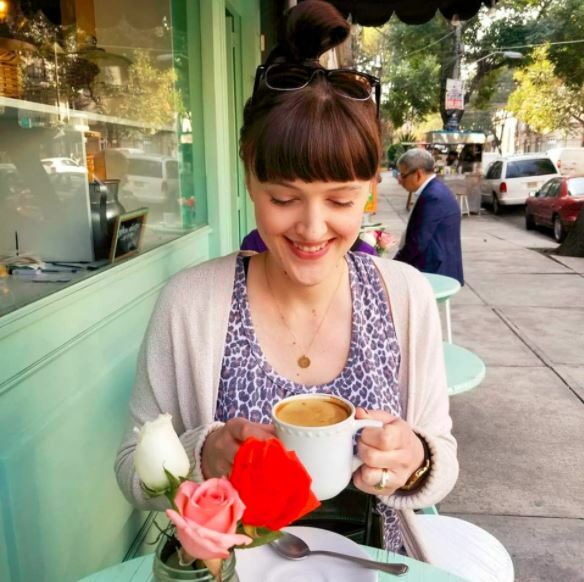 I am constantly adjusting – adding more mustard, salt, etc. – just get it to where you like. Then top with the remaining dill – I like this super dilly. Voila, you’re done! Serve as a side to almost anything, preferably outside, with a frosty beer and something meaty! I would love this! Love crunchy celery. David, not so much… Dill is so underrated! Agreed Debbie, I love dill in everything! Wow Love how this is loaded with herbs!!! I made something similar minus the mayonnaise but this looks delicious. Check mine out! Your recipe looks delish! 🙂 Thanks for sending over!